From a royal engagement in the United Kingdom, to an ice-cold marathon in Antarctica and the shocking result of a Bosnian Croat war crimes tribunal in The Hague, here is a rundown of the global stories that hit headlines this week. Dozens of journalists gathered in Cairo with candles and flags on Monday to remember victims of the the deadliest militant attack in Egypt’s modern history amid three days of national mourning. The assault by Islamist extremists on the al-Rawda mosque in Northern Sinai on Friday killed 305 people, and injured many others. Abdel-Mohsen Salama, head of the Egyptian press syndicate, said the vigil was aimed at sending a “united message” that “we are united against terrorism”. Hundreds of Bosnian Croats lit candles in public squares in cities around the country in memory of convicted Croatian war criminal Slobodan Praljak. Praljak died from drinking poison as his 20-year sentence was confirmed on appeal on Wednesday. The 13th annual ice marathon got underway in Antarctica last Friday, with 55 competitors from seven continents running in temperatures of minus 25 degrees Celsius. Denmark's Frank Johansen was the men's winner, while Kelly McClay took the women’s title for the US. 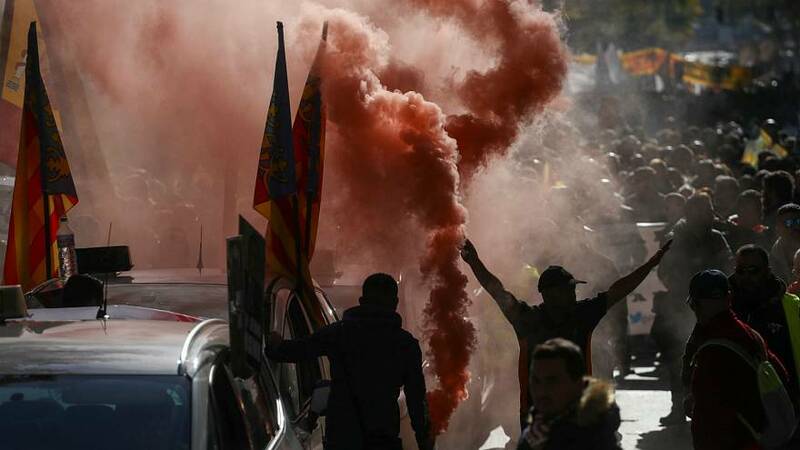 Spanish taxi drivers took to the streets of Madrid on Wednesday to protest ride-hailing apps such as Uber and Cabify. Around 20,000 people joined the protest, which was organised alongside a 24-hour strike amid complaints from unions that the companies are posing unfair competition. Hundreds of people joined a rally in Manila on Thursday to protest threats by Philippine President Rodrigo Duterte to declare a “revolutionary government”. Participants carried signs calling Duterte a “dictator” and a “fascist” in response to threats that he would abolish the constitution to crack down even harder on drug trafficking. His spokesman, however, said this would not happen. Police in Kenya fired rifles and tear gas on Tuesday to break up an opposition demonstration organised on the day of President Uhuru Kenyatta's swearing-in ceremony. Opposition leaders were addressing supporters after they were blocked from holding a memorial service for dozens of people killed during months of election turmoil when police moved in. The 17th edition of the annual Great Ethiopian Run was held in Addis Ababa on Sunday. More than 40,000 competitors from around 20 countries took part in the 10-km race, filling the streets of the Ethiopian capital. A Palestinian man was shot dead on Thursday by an Israeli settler in the village of Qusra, in the occupied West Bank. There are conflicting reports about the circumstances surrounding the incident. The Israeli military said the settler opened fire in self-defence after Palestinians threw rocks at an Israeli youth group who were hiking in the area, while Palestinian officials said the man was a farmer who had been working his land when settlers attacked him. Gunmen opened fire on worshippers at the entrance of a Shiite Muslim mosque in Islamabad on Wednesday, killing an intelligence officer on the scene, according to police. Another four people were injured in the shooting, carried out by three or four attackers on two bikes at the end of evening prayers. Young people in Burkina Faso protested on Tuesday as French President Emmanuel Macron visited the country. Youths threw stones at one of his delegation’s vehicles, while the French leader was later subjected to rowdy questions from university students following a speech in the capital, Ouagadougou. In his speech, Macron said he belonged to a new generation of French leaders who would build partnerships with the continent rather than tell it what to do. A drone captured footage of a what appears to be a tiger shark swimming close to beachgoers in Miami. The aerial footage showed the shark just metres away from one man wading in shallow water, before passing between the shore and at least two other people. Thousands of people were evacuated from areas near the Mount Agung volcano on the Indonesian island of Bali amid fears of a major eruption. The threat alert was raised to the maximum level as a column of white smoke rose out of Mount Agung and volcanologists continued to report tremors. Trump's tweet followed a missile launch by Pyongyang on Tuesday that flew longer and higher than any previous test. Around 150,000 people gathered in Myanmar for a public mass by Pope Francis in which he defended the rights of ethnic minorities. “I know that many in Myanmar bear the wounds of violence, wounds that are both visible and invisible. We think that healing can come from anger and revenge. Yet the way of revenge is not the way of Jesus,” he said. During the visit, the Pope avoided using the term Rohingya, which is rejected by Myanmar's government and military. Britain’s Prince Harry and US actress Meghan Markle announced their engagement on Monday. The couple posed for the press in the grounds of Kensington Palace and spoke of their relationship and future plans, with Harry saying he was “thrilled” with the engagement. A social media campaign was launched to raise money for Rohingya refugees in Bangladesh, raising more than one million euros in just one day. The Love Army movement was started by snapchat star Jérôme Jarre, French comedian Omar Sy and a host of other social media celebrities who traveled to a refugee camp to raise awareness of the plight of those fleeing persecution in Myanmar. Participants from around the world gathered in Peru’s Ica desert for the Marathon des Sables. The six-day desert race, which began on Sunday, sees participants tackle 250 kilometers in a test of fitness and endurance.